If you love noodles you will love soup rice noodles too. They are not as heavy as the noodles made from wheat and they have a very unique texture. Here are a few photos of soup rice noodles in this post. The recipe is for the Vegetarian Rice Noodles, however it doesn't have to be vegetarian, you can cook along with sliced meat, meatballs, ham or any meat that you prefer. This meal is versatile and easy to make in just 5 minutes. Prepare your sauce base before cooking the rice noodles. Add all sauce ingredients above to a serving bowl. Make sure it’s evenly mixed. In a medium pot, boil half pot of water. Add pea sprouts and rice noodles to boiling water and cook for 2 minutes. You can use a large pasta scoop or a skimmer to hold the rice noodles while you are cooking because rice noodles are very fragile. Make sure you don’t cook for too long or they will get soggy. Both pea sprouts and rice noodles can be ready very fast. Transfer the noodles to the bowl and add half-cup water from the pot (or your homemade soup if you already have it). Mix evenly with sauce. Now you are done!! It takes only a few minutes!! Here is another version of Oxtail and Tomato Soup Rice Noodles. 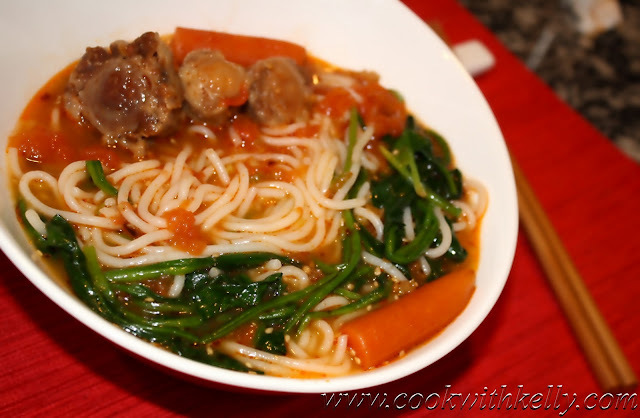 The soup noodles absorb all the flavour from the oxtail and tomato, and it smells so nice. 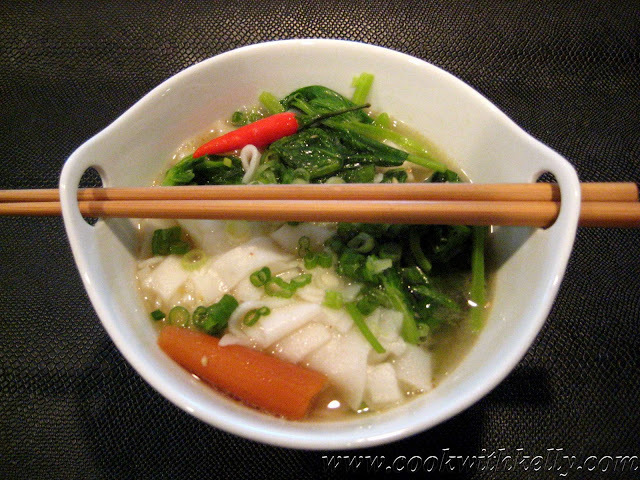 You can also use any homemade soup to make your rice noodles. Here is the version of the rice noodles which I cooked along with some sliced pork and Char Siu/BBQ pork.